Tom Doak's famous directory of international golf course has been revised and will be available for sale to Australian golfers via Planet Golf. This all-new edition of The Confidential Guide to Golf Courses will be published in five volumes, which will cover more than 2,500 of the world’s best courses. Volume 2 is now available and features North & South America (Winter Destinations). These reviews will provide honest and unvarnished viewers from the authors that will help you plan your golf vacations, business side trips and golf adventures. 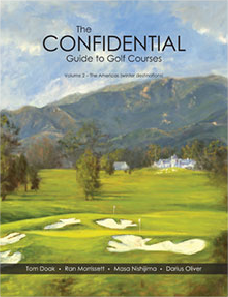 The Confidential Guide to Golf Courses is the most collected and most referenced golf book in the modern era. “Gourmet’s Choice,” a selection of eighteen courses the authors would take a friend to play. The Gazetteer, containing authoritative lists of the prettiest, hardest, best and wildest holes in the world. Diverse subjects as the Best Set of Par 3’s, Best Lunch, and Best Courses to Take Your Dog to Play. Over 100 photographs that attest to the reviews of courses, each beckoning golfers to go and try their luck. Of all the books in my golf library, it is by far the most fun to read. Also the most informative.